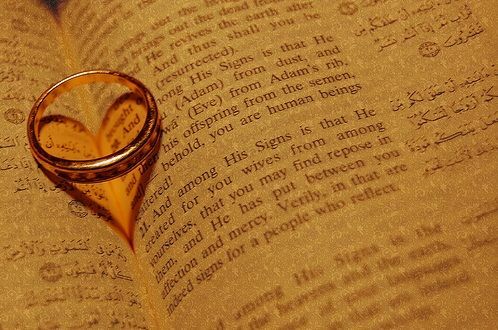 3 – Under the bond of wedlock, love and mercy are put into our hearts. What is interesting here is that the Arabic word for ‘love’ in this passage is not ‘ISHQ or ḤUBB which also means ‘love’. Instead, what is used here is MAWADDAH, which means ‘mutual love’; that is, a two-way traffic love. • Marriage is a religious-social contract which must be abided by both parties in letter and spirit as much as we can. • Marriage does not mean union of identical personalities, but a celebration of differences and living together with those differences. • To be in love does not mean looking at each other eye-to-eye, but to look toward the same direction. • The best way to have the ideal wife is to try to be the ideal husband yourself; in the same manner, the finest method of having the ideal husband is to strive to be the ideal wife yourself. • Lastly, as you are the earth and moon to each other, don’t forget to revolve together around the same Sun – which is your Ultimate Beloved. We wish you the best of luck in your new stage of life journey!